The terms retirement writers use to describe retirement plan failure can be confusing. 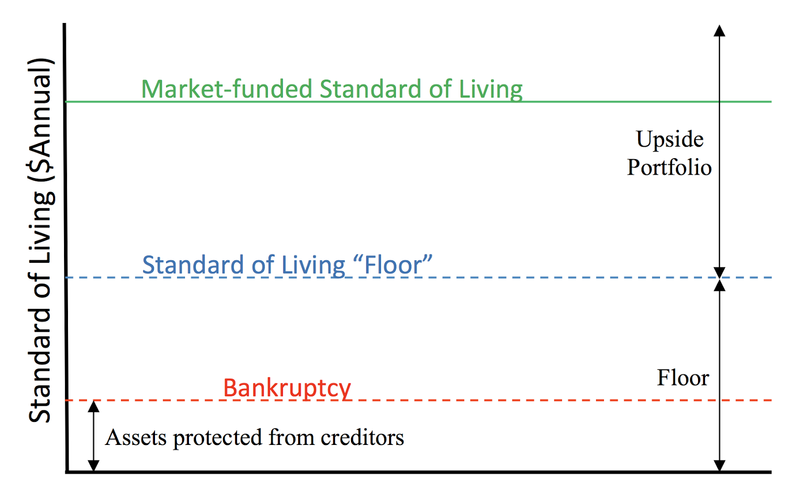 There are three progressive levels of failure: a loss of "market-funded" standard of living, a loss of standard of living below the household's "floor", and bankruptcy. A fourth kind of failure, depletion of one's investment portfolio, can contribute to any of these three levels of failure or none of them depending on the extent to which the plan relies on investments to support the standard of living. Investopedia defines standard of living as "the level of wealth, comfort, material goods and necessities available to a certain socioeconomic class or a certain geographic area." Merriam-Webster defines standard of living as "a minimum of necessities, comforts, or luxuries held essential to maintaining a person or group in customary or proper status or circumstances." Retirement writers and researchers often use the term "standard of living" in a more specific way that refers to the cost of purchasing these "comforts, material goods and necessities." For example, we might say that a household has adequate retirement assets to fund a $50,000 annual standard of living when what we mean is that the household can enjoy whatever standard of living $50,000 a year can purchase. We turn a dictionary definition into a dollar amount. The term "floor" describes the amount of relatively safe income available to a retired household. The floor is generated from assets with no market exposure. It is often used in the context of "floor-and-upside" retirement funding strategies as I described in Unraveling Retirement Strategies: Floor-and-Upside. Floor-and-upside strategies use financial products with no market risk, like fixed annuities, TIPs bond ladders, and Social Security benefits, to provide a floor, or minimum, of reliable income before investing any remaining assets in the stock market to provide the "upside" opportunity. The theory is that the retiree will be able to maintain some minimum standard of living (the "floor") even in the event of disastrous investment results in the upside portfolio. Since nearly all Americans are eligible for Social Security benefits, virtually all of us have some amount of floor but the level of that floor can vary greatly. Wealthy households will be able to build a floor that completely protects their standard of living regardless of investment results, while other households may have a floor consisting of only Social Security benefits that provides very little safety. The higher your floor, the less market losses will harm you standard of living. A floor is insurance and the more wealth you have, the more insurance you can afford. For example, assume that $50,000 a year is a retiree's desired standard of living but she believes that in the worst case scenario she could get by spending $40,000 annually. Spending less than this $40,000 a year would imply a significant change in her lifestyle. With a floor-and-upside strategy, she might try to build a $40,000 floor with Social Security benefits and fixed annuities and invest any remaining assets in the stock market. She hopes to generate $50,000 or even more annual income at the risk of having only $40,000. Whether she generates more or less than the additional $10,000 annually depends on her investment results – it's "market-funded." At the first level of retirement plan failure, our retiree would suffer a loss of standard of living providing less than her desired $50,000 of annual income but not falling below the floor level of $40,000. At the second level of failure, the retiree suffers a greater loss of standard of living that drops income below $40,000 a year and requires a significant lifestyle change, but isn't a large enough deterioration of her finances to trigger bankruptcy. If $40,000 of income is provided by "safe" floor assets, then how can a retiree's standard of living fall below $40,000? There are two ways. First, no asset is perfectly safe, though TIPs bonds are pretty close. Social Security benefits might be reduced in the future. A pension plan might fail. In this context, "safe" means not exposed to market risk. A floor isn't totally safe from all risks but it is relatively much safer than an investment portfolio. Second, standard of living can also be disrupted by unexpected expenses. A floor guarantees income; it does not guarantee that income will exceed expenses. One challenge with this model is that the same standard of living has different price tags in different places. $50,000 purchases a higher standard of living in Manhattan, Kansas than in Manhattan, New York. Another challenge is that defining a floor amount is much easier in theory than in practice as you will see if you try making a list of living expenses you could live without. The term "ruin" better applies to bankruptcy than to portfolio depletion, which may or may not lead to bankruptcy. Even in bankruptcy, a well-planned retirement can protect significant retirement assets. Social Security benefits are protected from creditors. According to NOLO Press, "ERISA-qualified retirement accounts are generally protected from judgment creditors, as are employee welfare benefits (like medical insurance, HSAs, and employer disability benefits)". Non-ERISA plans are typically not protected. Your state may provide additional protections in bankruptcy. A few states, for example, such as Florida, New York, and Texas, protect any annuity owned by a resident of the state from creditors. Check the bankruptcy laws for your state of residence. Federal law also affords bankruptcy exemptions. According to NOLO, "state law determines whether you can use federal exemptions or whether you must use your state property exemption list." "Risk of ruin is a concept in gambling, insurance, and finance relating to the likelihood of losing all one's investment capital or extinguishing one's bankroll below the minimum for further play." —Wikipedia. "The complete loss of one's money and other assets." —Oxford Dictionary. Definitions range from the total loss of all assets to the practically-total loss of investment capital only. In retirement finance, however, "ruin" almost always refers to the depletion of one's retirement savings investment portfolio. While many retirees focus on the probability of totally depleting their investment portfolio prematurely, retirement's so-called "probability of ruin", a decline in portfolio value large enough to lower their standard of living without actually depleting their investment portfolio is far more likely and less catastrophic. The magnitude of this risk depends on how much of the household's standard of living is funded by an investment portfolio compared to how much is funded by financial assets with no market risk. Higher "floor" lines, blue in the chart above, mean less risk to standard of living. When sustainable withdrawal rate advocates say there's a 95% chance that you won't deplete your savings portfolio, they aren't promising a 95% probability that you won't lose standard of living. And when they say there's a 5% probability of ruin, they're referring to depleting your portfolio, which might or might not ruin your retirement. A household that funds its standard of living entirely with Social Security benefits and fixed annuities can accept a greater probability of portfolio depletion — which is to say they can spend more, invest more aggressively, or both — than a household that depends on an investment portfolio to fund part of its standard of living. Research by Wade Pfau shows that purchasing fixed annuities can actually lead to larger final estates for this reason. "Though SPIAs [single-premium immediate annuities] do not offer liquidity, they provide mortality credits and generate bond-like income without any maturity date, and they support a higher stock allocation for remaining financial assets. Altogether, this allows a client to better meet both retirement financial objectives [spending and a legacy]". In fact, there is a valid argument that depleting an investment portfolio before the end of retirement and relying on fixed annuities and Social Security benefits thereafter can be the most efficient way to fund retirement in some scenarios. Three degrees of bad: Level of retirement plan failure. To quote more research by Pfau, "Certain circumstances, which we will explore, may allow retirees to accept a higher probability of “failure,” and spend more aggressively from their investment portfolio. Depleting the investment portfolio is not always catastrophic." Depleting the portfolio can be part of an efficient retirement plan, no big deal for household's with other sources of income, or catastrophic for a household that greatly depends on income from the portfolio. How does this relate to the list of risks I posted in Retirement is Risky Business – Here's a List? Portfolio Depletion Risk is a combination of risks already on that list. A retiree's portfolio can be depleted by withdrawing too much from her portfolio periodically (excess withdrawal risk, overspending risk), by experiencing an unfortunate sequence of market returns early in retirement (sequence of returns risk), or by experiencing unexpected spending shocks (unexpected financial responsibility risk, health expense risk, and others), so I think this one is already well covered. Although my previous list didn't identify bankruptcy risk separately, it did identify other risks that often lead to bankruptcy. Less than half a percent of elder Americans claim bankruptcy but the consequences are usually grave. The magnitude of bankruptcy risk often depends on how well the retiree has protected assets from creditors. Since it demands a different kind of mitigation (asset protection), bankruptcy really should be identified as a separate risk. I'm going to add bankruptcy risk to the list and define it as the probability that a retired household will need to claim bankruptcy and its magnitude as the total value of all assets not protected from creditors. Retirees with an investment portfolio may be exposed to the risk of losing market-funded standard of living. I will also add it to the list and define it as the risk of losing standard of living due to investment losses, presuming that standard of living does not fall below the household's floor of safe income. The amount of standard of living at risk is the amount expected to be generated by the investment portfolio. The probability of the risk can be estimated with Monte Carlo simulation. There are three degrees of retirement plan failure that should not be confused. The first is a decline in market-funded standard of living. Not the best outcome, but still better than having your standard of living decline below what you might consider unacceptable. Mitigate this risk with a higher floor. The second is a decline in standard of living below what the retiree considers to be the minimum acceptable floor. This will likely result from expense shocks. Mitigate these risks with insurance when possible (health insurance, umbrella liability insurance, and long-term care insurance, for example), by setting aside reserve funds, or both. The third level is bankruptcy, which represents the most severe failure of the retiree's finances. Asset protection is an important component of a good retirement plan. It is also worth carefully considering those risks that most often lead to bankruptcy, the first five on the list. An unplanned, premature depletion of the household's investment portfolio can lead to poor outcomes but that event is not a single level of failure. Depending on the extent to which the retiree depends on that portfolio to support his standard of living, portfolio ruin can expose the household to one of the three levels of retirement plan failure or it might be acceptable. Calculating the amount of your standard of living that will be market-funded (subject to market risk). Calculating the total of assets protected from creditors. Review your state's bankruptcy protections. If your state permits use of federal exemptions, review those, as well. Sketching a chart like the one above from this information may provide some interesting insights into your plan's levels of risk. The (Interconnected) Reasons Elder Americans File Consumer Bankruptcy: Journal of Aging & Social Policy: Vol 22, No 2, Deborah Thorne, Ph.D. (Downloads PDF). 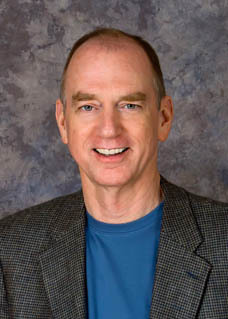 Can I Keep Social Security Benefits in Chapter 7 Bankruptcy?, NOLO.com. Can Judgment Creditors Go After My Retirement Accounts?, NOLO.com. An Efficient Frontier for Retirement Income by Wade D. Pfau, Wade Pfau, Ph.D. Taking Portfolio Spending into the Real World For Retirees, Wade Pfau, Ph.D.
 Retirement is Risky Business – Here's a List? (download spreadsheet). Bankruptcy Exemptions by State, Nolo.com. The Federal Bankruptcy Exemptions, Nolo.com. If your pension fails, you should contact the Pension Benefit Guaranty Corporation. While you will not necessarily recoup 100% of your pension, someone whose total income is no more than $50,000 probably has a smaller pension making it more likely that they will end up being made whole or closer to it than someone whose pension alone is $50,000+. This article is well written and provides the reader with incentives to better protect their financial assets, but Mr. Cotton failed to address a growing concern for retirement investors today, that being financial fraud. Most frauds are perpetrated outside the "market risk" profile, usually involving plan providers selling their off market proprietary funds to unwary 401k investors. This practice contributed heavily to the millions of investors who experienced "plan failures" during our last financial crisis of 2008-2009. Unless the buying public is educated and made aware of this conflicted practice, history will repeat itself in the next financial collapse as well. I hope concern is growing; the risk certainly is. Elder fraud is off-topic for this particular post, but I have addressed it in many posts in the past. It is also included in my recent risk of retirement risks.